Sant Namdev was an ananya bhaktha of Panduranga Vittal of Pandharpur whose abhangs overflow with the nectar of Bhakti and love towards God. Sikhs also revere him as a holy man, Bhagat, and sixty and odd abhangs of his are featured in their holy book, Guru Granth Sahib. His writings form the basis of the beliefs held by the Varkari group, the monotheistic group owing allegiance to Panduranga Vittal of Pandharpur. He was a contemporary of Sant Jyaneswar, who had a great influence on him. He also accompanied Jyaneswar on a long pilgrimage to several holy places all over India. He had a great influence on Sant Tukaram, who described him as one besides Lord Panduranga, who came in his dream and inspired him to write abhangs. Namdev came of a lower caste family whose members belonged to the Varkari group and were sincere devotees of Lord Vittal of Pandharpur. As a child he found great pleasure in repeating the name of Lord Vittal and he also enjoyed visiting the temple with his mother. One day as his mother could not go she asked Namdev to go by himself and offer the food to the Lord. Namdev took the plate of food and placed it before the Lord and waited for it to be taken by the Lord. When this did not happen he cried and begged the Lord to accept it. His pleas were so sincere that Lord Vittal appeared before him in human form and consumed the offerings. He went home happily and narrated to his mother what had happened. She could not believe it and so the next day after sending him to temple she followed him without his knowledge and watched for herself the Lord’s acceptance of the offering. Her joy and pride in Namdev was coupled with her gratitude to the Lord for the Grace He showered on Namdev. The place where he entreated the Lord to accept his offering has been marked in the temple and is called the Namdev Pairi (steps of Namdev). But she despaired of him also as he showed no interest either in school studies or in father’s business and was indifferent to worldly matters. To the neglect of everything else viz. food, studies, sleep etc. he spent his time in singing Bhajans and dancing and in devotion to Lord, whom he treated as a dear and near one. His marriage to Radha Bai, a worldly-minded person, made no difference. He spent hours sitting before Lord Vittal, talking to Him, discussing spiritual matters with Him and doing Bhajans, and no amount of persuasion from family or friends could turn his attention to everyday affairs with the result there was extreme poverty in the house. Their despair was so intense that it turned to abuse of the Lord Panduranga Vittal, whom devotees referred to as Vithoba, also. Vithoba decided to help his family and in the guise of Dharma Setti of Vaikunthapuram, an old friend of Namdev, He visited Namdev’s house, gave gifts of rice and other essentials to Radha Bai and disappeared. Radha Bai had a friend who was married to a great devotee of Lord Krishna, by name Parisha Bhagavat. Parisha Bhagavat as a result of his prayers obtained from Lord a philosopher’s stone which could convert iron into gold. This his wife showed to Radha Bai. Radha Bai took the stone to her husband and chided that Namdev’s Bhakti was no good and that it was inferior to the Bhakti of Parisha Bhagavat. Namdev collected the stone and coolly threw it into the river. When Parisha came to know of this, he took Namdev to task. Namdev took Parisha to the place where he had dropped the stone. Parisha searched for the stone and found, not one philosopher’s stone, but many. Parisha was struck with wonder and admiration for Namdev’s attitude of renunciation and his spiritual powers. Radha Bai also stopped comparing him with others and chiding him for his indifference. 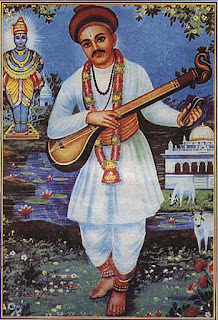 When Namdev was about twenty years of age, he came under the influence of Sant Jyaneswar. Jyaneswar was greatly impressed by Namdev’s devotion to Vithoba, and he requested Namdev to accompany him in his pilgrimage to several holy places in the country. Namdev did not want to leave Vithoba, but he was persuaded to go on pilgrimage with Jyaneswar. They stayed together thereafter until the death of Jyaneswar. Their pilgrimage covered all parts of India, east, west, north and south and wherever they went they were composing and singing devotional songs. In the course of the pilgrimage they met Narsi Mehta at Junagath, Kabir at Kasi, Tulsidas at Chitrakut; Nanak in Deccan. Namdev gained much, during the pilgrimage, from the society of Jyaneswar gaining a wider vision of the whole world as the manifestation of God. Let us see a few of the miracles that happened in their joint pilgrimage. When they were travelling in the desert of Marwar, Namdev was suffering extreme thirst. They found a well, but it was so deep that it was impossible to draw water by ordinary means. Jyaneswar proposed to assume the form of a bird using his Laghima Siddhi and bring the water up in his beak, but Namdev refused and prayed to Rukmini Devi. The level of the water rose miraculously to the surface. This well exists today at Kaladji, ten miles off Bikaner. When Namdev and Jyaneswar started Bhajans in Naganathpuri temple, a huge crowd gathered, and the temple priests became angry as they were not able to enter freely the temple. So Namdev shifted to the western gate of the temple where he was doing Bhajans the whole night. Next morning the priests were surprised to see idol turned to face Namdev. They apologised to Namdev who prayed to the Lord who turned to face the entrance. At Bidar, a Brahmin invited Namdev to do Kirtan in his house. Namdev went there with a large number of devotees. The Sultan was alarmed mistaking the entourage for rebel troops. He sent General Kasi Pant to investigate and the general reported back that it was only a religious party. But the Sultan still not satisfied ordered Namdev either to embrace Islam or prove his credentials by bringing back to life a butchered cow or face death at elephant’s feet. Namdev’s mother begged her son to embrace Islam and save his life. Instead, Namdev chose to raise the dead cow and succeeded to the amazement and admiration of the Sultan and his party. He is the One in many, countless are His shapes and forms. He pervades all that exists; wherever I look, He is there. With her multiple reflections of color and alluring beauty. Sometime after they returned from the long pilgrimage, Jyaneswar expressed his desire to go to Alandi where he wanted to take Samadhi. Namdev accompanied him to Alandi as he could not part with Jyaneswar. He was with Jyaneswar till his last moment. Namdev did not live long after the Samadhi of Jyaneswar. Namdev soon attained his Samadhi at his age of twenty-six at Pandharpur. Of the numerous Abhangs he composed, many were lost and only four thousand are left, which even this day are a great source of inspiration to all who would read them, making him one of the most popular Maharashtrian saints known all over India. Great read! Thanks aplenty.Hearty congratulations. Kindly carry on with this noble work.